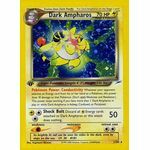 Pokemon Power: Conductivity: Whenever your opponent attaches an Energy card from his or her hand to a Pokemon, this power does 10 damage to that Pokemon. (Don't apply Weakness and Resistance.) This power stops working if you have more than 1 Dark Ampharos in play or while Dark Ampharos is Asleep, Confused, or Paralyzed. [L][C][C] Shock Bolt: 50 damage. Discard all [L] Energy cards attached to Dark Ampharos or this attack does nothing. 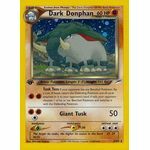 [G][G] Dark Drain: Flip a coin for each of your opponent's Pokemon. For each heads, this attack does 10 damage to that Pokemon. Don't apply Weakness and Resistance. 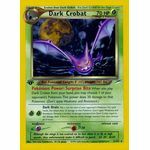 Remove a number of damage counters from Dark Crobat equal to the damage dealt. If Dark Crobat has fewer damage counters than that, remove all of them. [F][F] Tusk Toss: If your opponent has any Benched Pokemon, flip a coin. 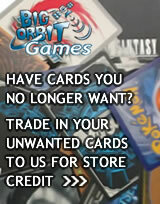 If heads, return the Defending Pokemon and all cards attached to it to your opponent's hand. If tails, your opponent chooses 1 of his or her Benched Pokemon and switches it with the Defending Pokemon. [F][F][C] Giant Tusk: 50 damage. [C] Gouge: 10+ damage. Flip a coin. If heads, this attack does 10 damage plus 10 more damage; if tails, this attack does 10 damage. 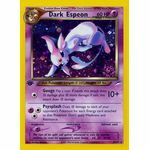 [P][C][C] Psysplash: Does 10 damage to each of your opponent's Pokemon for each Energy card attached to that Pokemon. Don't apply Weakness and Resistance. 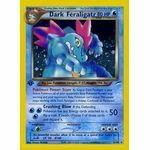 Pokemon Power: Scare: As long as Dark Feraligatr is your Active Pokemon, all of your opponent's Baby Pokemon Powers stop working and your opponent's Baby Pokemon can't attack. This power stops working while Dark Feraligatr is Asleep, Confused, or Paralyzed. [W][W][W] Crushing Blow: 50 damage. If the Defending Pokemon has any Energy cards attached to it, flip a coin. 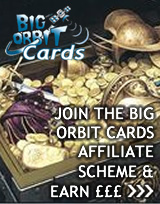 If heads, choose 1 of those cards and discard it. 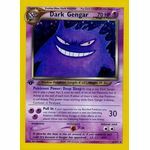 Pokemon Power: Deep Sleep: As long as any Dark Gengar are in play, a player flips 2 coins for each of his or her Pokemon that is Asleep at the end of each turn. If either of them is tails, that Pokemon is still Asleep. This power stops working if Dark Gengar is Asleep, Confused, or Paralyzed. [P][P][P] Pull In: 30 damage. If your opponent has any Benched Pokemon, you may choose 1 of them and switch it with the Defending Pokemon (before doing damage or other effects of this attack). Either way, the Defending Pokemon is now Asleep.